At the 2015 Frankfurt Motor Show , Ferrari unveiled its one of the most awaited Ferrari F12tdf 2016 . With incredible power beneath its hood and the menacing appearance the model Gained commendable appreciation at the show. Speculated to take the Berlinetta and FF heritage ahead the company has lot of expectations from this model. 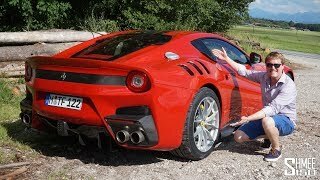 Let us have a look at the reviews of Ferrari F12tdf 2016 to know in detail about the model. The interior of Ferrari F12tdf 2016 might look similar to supercar standards but a close inspection will Undoubtedly highlight differences. The First Thing That You'll notice inside the model is the missing leather. Yes the leather is not present inside this Ferrari except for its steering wheel. All you can notice is large amount of carbon-fiber, aluminum and high-quality plastic or Alcantara. The carbon fiber work can be noticed over the door panels and the dashboard till. The glove compartment Has Been removed while the instrument panel house and satellite pods are made from lightweight carbon-fiber. The seats feature yellow stitching over the black upholstery to add the contrast. In all the interior details of Ferrari F12tdf 2016 are more of performance oriented and least into nonsense amalgamations. The exterior of Ferrari F12tdf 2016 makes the model look blackberries and aggressive sports. Starting with the front end there is a new hood featuring V-shaped power bulge and has new vents for better engine cooling. The air ducts are Also given massive shape while the carbon fiber splitter not only serves the purpose but aerodynamic Also adds to the looks. Moving towards the rear you'll have round shaped LED taillights over the massive trapezoidal indented bumper making its way till the wide diffuser. The front fender gets a new vent while the side skirts to get massive look with a wider stance. 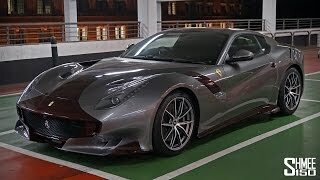 In all the exterior details of Ferrari F12tdf 2016 looks extremely barbaric rolling over the lightweight aluminum wheels. Beneath the hood of Ferrari F12tdf 2016 is a 6.3 Liter V12 engine producing total output of 769 hp and peak torque of 705 nm paired to dual clutch transmission. 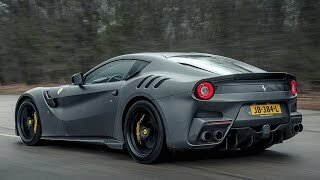 With this power the top speed of Ferrari F12tdf 2016 touches the mark of 211 mph while the 0-62 mph sprint can be knocked in just 2.9 seconds.